During the Second World War, a number of tanks and other armored vehicles were disarmed and used as carriers. The best examples are the Allied ‘Kangaroo’ vehicles used as tracked APCs or German ammo carriers (like the Munitionsträger Hummel) which were just disarmed self-propelled guns. The CP armored tractor is such a converted tractor, but fictional. It is based on the real TKD self-propelled gun but without armament. The disarmed TKDs are claimed to have been slightly modified and assigned to tow the 75mm wz.1897 cannons (the version with rubber wheels). 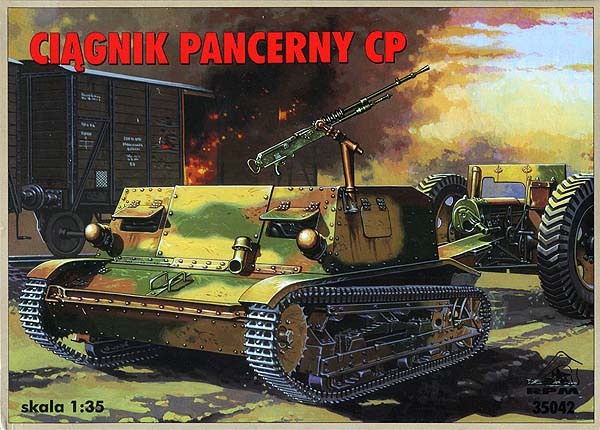 The box art of the RPM model kit of the CP armored Tractor. The wz.1897 was actually a French mle. 1897 gun that was used by the Polish army – it was one of the most popular cannons in the army of Second Polish Republic. Some of these guns were improved with tyred wheels, however, most of them had wooden spoked wheels. These guns were towed by horses or by C4P half-tracks. The wz.1897s were used in the September Campaign during all significant battles, frequently in an anti-tank role. There is no reliable source that confirms the existence of a vehicle called “CP”. Also, no such conversions of TKDs are mentioned in literature. However, TKD self-propelled guns were used in 1938 (during the annexation of Zaolzie) and later probably in the September Campaign (in defense of Warsaw). Moreover, a photo from September 1939 show an abandoned TKD without its cannon – so it is possible that some TKDs were really disarmed and used as tractors or carriers. However, they also might have just been disarmed to prevent the invading Germans from using them. Also, the kit shows a plate being bolted or riveted over the gun aperture, which is also missing from the vehicle in the picture. This plate would have been hard to remove (and for little gain) or to have been blown out if the vehicle was destroyed. 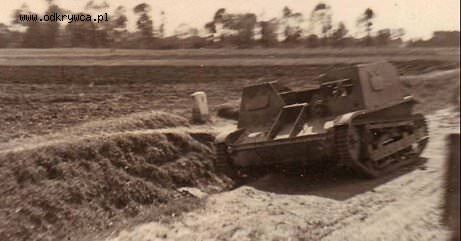 A TKD self-propelled gun abandoned on the side of a road with its gun missing, probably in September 1939. However, it doesn’t look like the fake CP armored tractor – Source: odkrywca.pl. Thus, a second life of the TKDs as disarmed carriers is possible. 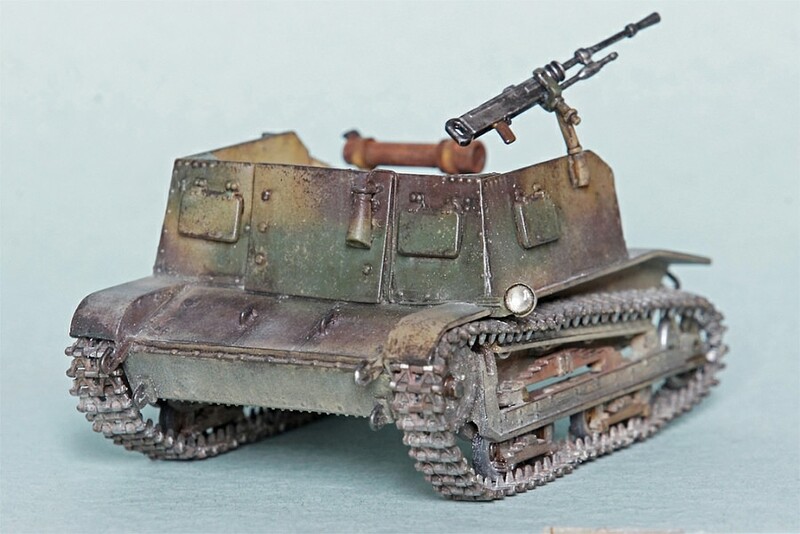 Nevertheless, the existence of the claimed “CP” type vehicles can be declared as fiction, as nothing confirms the other changes shown in the model kit, apart from the cannon disarmament. The main difference from the TKD is, of course, the lack of a gun. Its place in the frontal armor is covered with a riveted armor panel. The vehicle has two headlights, one on each side, not only on the left (like on the TKD). Moreover, the CP has a hook at the back of hull, used to tow the cannon. However, this hook looks a little too fragile for something destined for towing a cannon weighing about 1.5 tonnes. The only armament of the CP is a machine-gun placed on the left side of the hull for self-defense, on the standard stand, known from regular Polish tankettes (TK-3 and TKS). It is a 7.92mm wz.25 machine gun, however, the kit also includes a 7.92 wz.30 machine-gun. Both of these were used in Polish vehicles against aircraft or infantry attacks. The CP is certainly a fictional vehicle, however, its design could have been pretty successful. The similarity to the British Universal Carrier or French Renault UE tankette is clearly visible. These vehicles were very useful support vehicles, being used until late in the war. The CP, as the Polish counterpart of Universal Carrier, could have been a good multi-role support vehicle, as the TK3 on which it was based was a decent vehicle. The German army kept using captured TK vehicles even in 1944 – and mainly as tractors and carriers. It is uncertain if the CP could have been a suitable tractor for the wz.1897 cannon. Unlike the real C4P, the fictional CP had no space for the wz.1897 cannon’s crew nor for its ammo. Also, it was certainly underpowered if it was meant to tow a 1.5 tonne gun. The specialized C2P tractor was able to tow wz.1897, but it was a purpose-built tractor – the CP is portrayed as an improvised vehicle. The C2P had a strengthened chassis and a solid towing hook. The Polish specialized tankette-based tractor was the C2P. 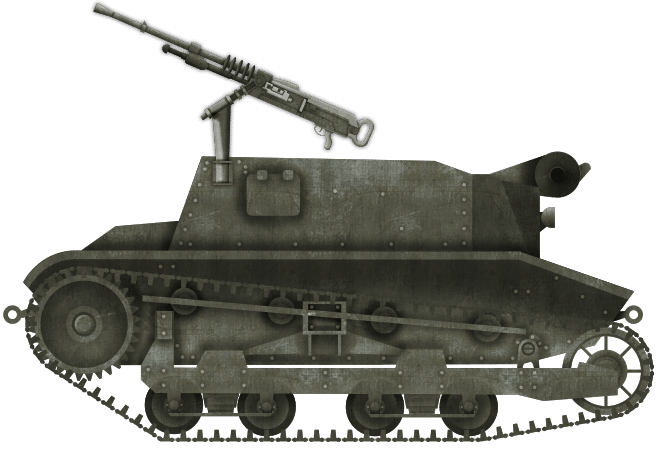 Designed in 1932 and based on the TKS tankette, it had an improved chassis with new side clutches and bigger wheels at the back. Initially, the Polish army rejected this machine (in favor of a horse rig). However, it was later used especially for the 40mm Bofors anti-aircraft gun. Unfortunately, the low budget of the Polish army hindered modernization effort and precluded the C2P from being used with other types of cannons. The production that started in 1937 was stopped by the war. The German army gladly used captured C2Ps. These tractors were used on all fronts to the end of the war. 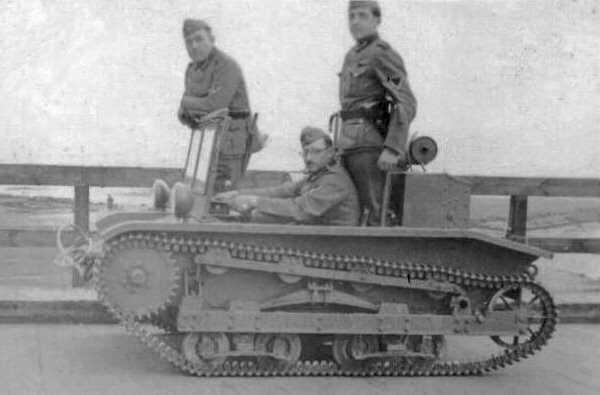 During 1930s, Polish engineers designed special trailers to be towed by tankettes. One type of trailers – with tracks – was designed for spare parts. The second type – wheeled – was designed for barrels of fuel and oil. Another trailer was designed for the RKD long-range radio and a crew of 4 men. The actual use in service of these trailers is barely known. 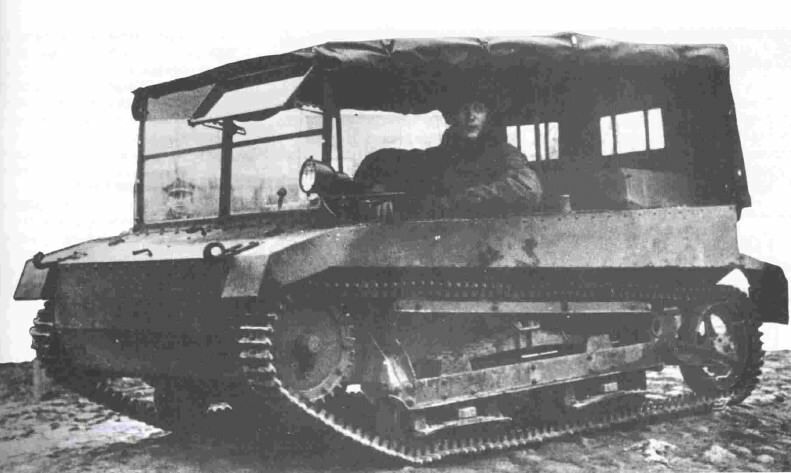 The German army used captured TK tankettes for reconnaissance, against guerillas and sometimes just as support vehicles. These vehicles were used on all fronts until the end of the war. Sometimes, they were further modified by Germans. Some photos show a TKS with a simplified gun mount or a TK-3 reworked into a tractor very similar to the C2P. Nice work on the illustration! Great and interesting article!, thanks for the nicely done illustration Mr. Baker!